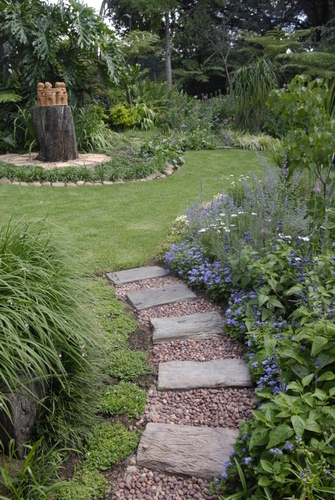 Discover how to use focal points to create interest in the garden. An easy way to give your garden an instant pick-me-up is by making use of appropriately placed focal points. These will add interest to your garden by catching the viewer’s attention. Their gaze will linger on that feature a while before taking in the rest of the garden. In addition, a focal point can distract the eye from a less pleasing sight, such as neighbour’s double storey house wall. A tiny garden may only require one focal point to maintain interest. In a large garden a number may be used. But you should only be able to see one focal point at a time when you stroll around your garden. Position a focal point where it will draw the eye as you go round a corner or go from one section of the garden to another. If your garden is formal in layout, position the focal point at the end of an axis line, or in the very centre of the garden. Whatever item you choose to create a focal point, make sure you keep it in scale with the garden and the length of the vistas. Too large a focal point will dwarf a small garden, while too small an item tends to the ridiculous. 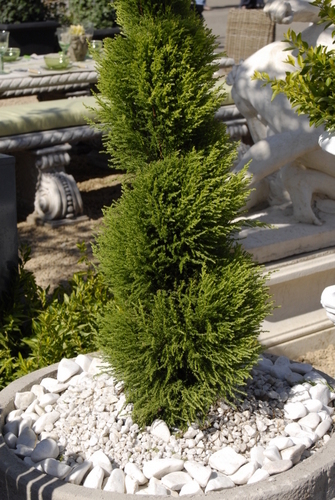 Evergreen trees which have a pyramidal or columnar shape – in this regard conifers are ideal. Palms are eye-catching if used sparingly. In small gardens, architectural plants can be used if they are in scale with the garden. 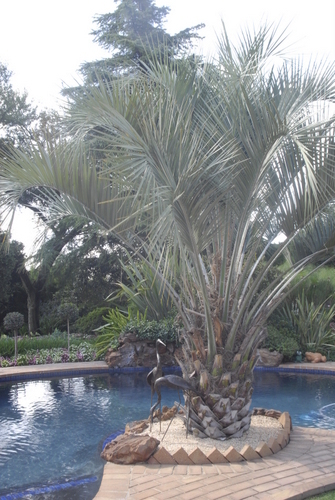 Architectural plants are those with a strong and dramatic shape or foliage that make them stand out from other plants, for example, the quiver tree (Aloe dichotoma), New Zealand flax, cycad, stemmed aloe, tree fern, cordyline, or halfmens (Pachypodium spp.). Garden furniture such as a garden bench or patio furniture - place at a point where a viewer will be tempted to linger and rest. A building such as a gazebo or summerhouse makes an ideal focal point as long as it harmonises with the style of the house. Artefacts such as lanterns, birdbaths and sundials can be used to good effect. 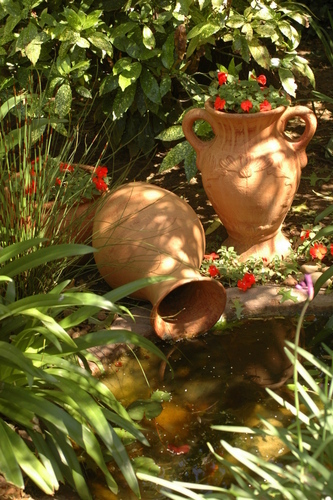 Containers such a classical urn or terracotta pot (if large enough), can make excellent focal points. If the container is a trifle small, place it on a plinth to make it more eye-catching. 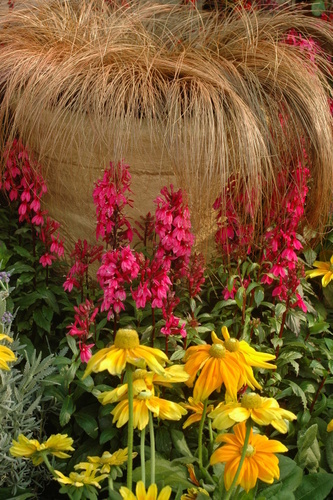 Plant up the container with an architectural plant or let it stand on its own. 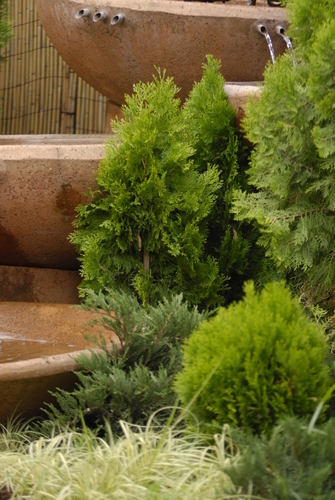 Fountains and waterfalls make excellent focal points, not only because they have a vertical quality, but because the water moves and sparkles in the sunlight, immediately catching the eye. 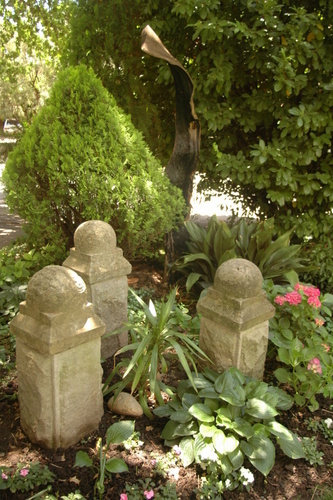 Statuary has for a long time been used as focal points in gardens. The statuary should relate to the style of the garden, for example, classical statuary in a formal Italian garden and abstract pieces in a modern style garden.